Who will Tom Brady throw to in 2018? This question was asked numerous times over the last 18 years in Foxboro and while the New England Patriots have been set at the wide receiver position over the past couple years, their fans may consider the group to be a weak link of the team once again. The Patriots traded deep-threat Brandin Cooks to the L.A. Rams this offseason, veteran wide receiver Danny Amendola left for Miami in free agency, the team released oft-injured Malcolm Mitchell after just one healthy season and Julian Edelman has been suspended for the first four games of the regular season. So really, who will Tom Brady throw to this season? New England will have just two receivers this season – Chris Hogan and Phillip Dorsett – who played more than 40 snaps for the Patriots last year. Furthermore, even they failed to combine for more than 1,000 snaps during the regular season. However, Dorsett never really seemed to be on the same page with Brady as he struggled to get into rhythm all season. Eventually, he finished 122nd among 158 qualifying wide receivers in yards per route run at just 0.95. Despite reports that the Patriots had high hopes for Dorsett in 2018, his struggles have continued in the preseason. Dorsett has run a pass route 31 times over New England’s first two preseason games and he has been targeted five times but caught just one pass for four yards. As a result, even though he has experience in the Patriots’ system, it cannot be taken for granted that he’ll even make the final roster. Hogan on the other hand is considered to be New England’s No. 1 receiver, especially in the absence of Edelman. While he was also out for an extensive period in 2017, Hogan finished the season with a career-high seven receiving touchdowns. However, once we look beyond those touchdowns, we can see that he didn’t necessarily had an excellent season. Hogan struggled coming up with plays as he caught a career-low 58.1 percent of the passes coming his way and broke a career-low one tackle after the catch in 2017. He also dropped four of his 47 passes while averaging 13.7 yards per reception, which was a significant decrease from his average of 18.4 in 2016. Although Hogan is a lock to make the Patriots roster and Brady will have to heavily rely on him, especially in the first month of the season, he too has struggled so far this preseason. He’s dropped two of his seven catchable targets while his longest reception has been for just eight yards as he’s averaged 1.0 yards after reception. Although the Patriots brought in Kenny Britt late last season, the veteran is still seemingly unfamiliar with New England’s system as he played just 40 snaps last season and was a healthy scratch for all three playoff games the Patriots played. The former first-round pick had his lowest-graded season since 2013 as his overall grade of 56.2 ranked just 99th among wide receivers in 2017. He turns 30 years old as the season starts and has yet to play in the preseason as he has been sidelined with an injury. While Britt’s experience might give him the edge over some of the younger receivers, his roster spot might be in jeopardy if he cannot dress for the third preseason game. 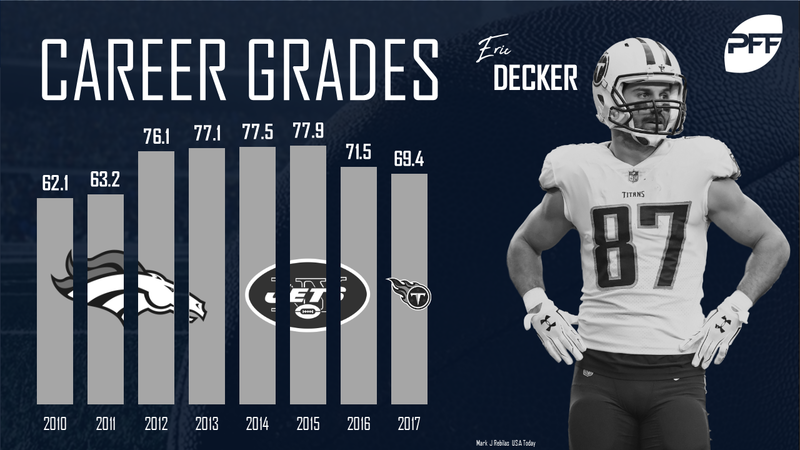 Similarly, Eric Decker showed signs of decline last year in his lone season at Tennessee as he recorded his lowest grade since 2011. However, his overall PFF grade of 69.4 still ranked 48th among all wide receivers. The Patriots signed Decker just before the preseason started, but he has failed to impress so far. Decker has reportedly struggled in Patriots practices while he was targeted just twice on 16 pass routes in the first two preseason games, dropping his lone catchable target and is the lowest-graded Patriots receiver so far this preseason. At this stage it does not seem like Decker has much to offer and he too probably faces an uphill climb to make the roster. Cordarrelle Patterson, considered to be more of a returner throughout his entire career, might be the biggest positive surprise of New England’s training camp so far. 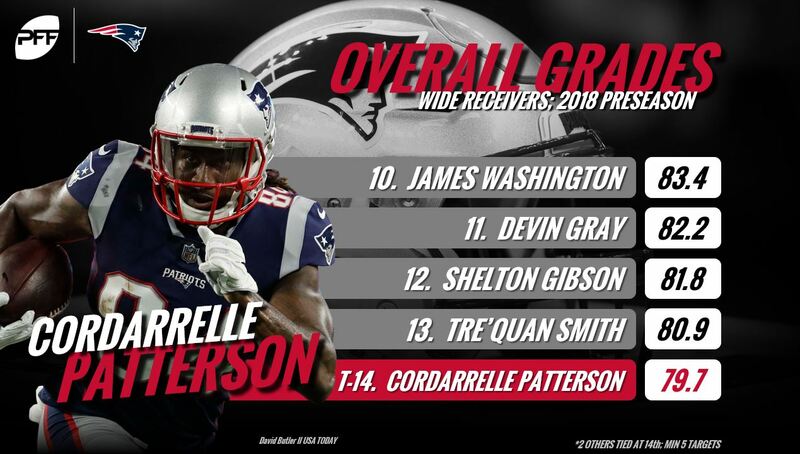 Patterson’s overall PFF grade of 79.7 ranks 14th among wide receivers with at least five targets this preseason. Furthermore, Patriots quarterbacks have a passer rating of 135.9 on the nine passes thrown his way. The latter would project to 72 targets through an entire season, which would tie his career-high from all the way back in his rookie year. While it’s always risky to draw conclusions from preseason, the Patriots putting the ball into the elusive Patterson’s hands about four-to-five times a game could add an extra element to the New England offense. He’s viewed as a roster lock already because of his return skills, but he might make the roster with his contributions as a wide receiver alone. Third-year receiver Devin Lucien was drafted by New England in 2016 but was waived by the Patriots in 2017. The former Arizona State player spent time on the practice squads of four different teams before returning to New England a month ago. 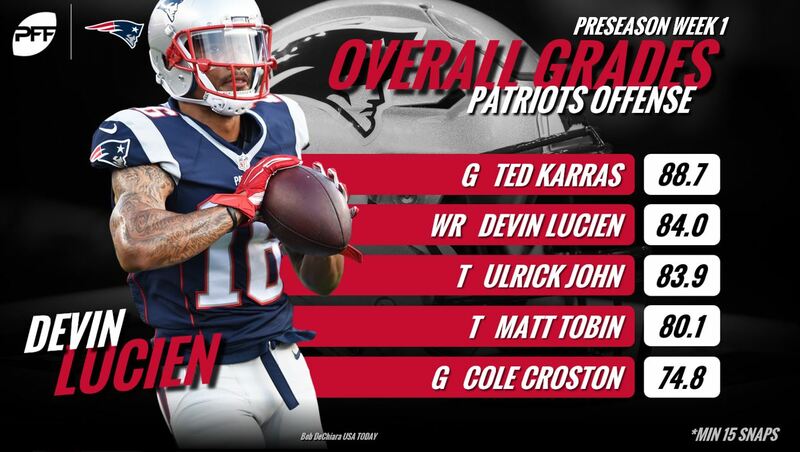 Lucien impressed already in the Patriots’ first preseason game this year as he caught four passes for 71 yards and broke a tackle en route to a PFF overall grade of 84.0 in that game. However, he failed to catch his only catchable target against Philadelphia in the second game for New England. While his inconsistency might hurt him, his contributions on special teams make him a surprise candidate to make the Patriots roster. Rookie receiver Braxton Berrios, who was drafted in the sixth round by the Patriots, might seem like a natural fit to replace Danny Amendola and play in place of Edelman in the first four weeks in the slot. Berrios recorded nine touchdown receptions from the slot last season at Miami, which was tied for the third most in college football. However, much like the other New England receivers, he’s failed to stay healthy in August, which resulted in him missing the Patriots’ second preseason game against Philadelphia. In addition, Berrios finished his lone game against Washington with just one reception for three yards. The rookie seems to be on the roster bubble and in need of an impressive performance against Carolina to make the team. Riley McCarron was signed to the Patriots practice squad early last season and has failed to do enough to suggest he could be more than a practice squad member in 2018. While McCarron was on the field for 70 snaps, including 31 pass routes, so far in the preseason – the most among New England receivers – he was targeted just twice and dropped one of those passes while he gained just six yards on his other reception. With the other receivers making more of their opportunities, it would be a surprise to see McCarron make New England’s final roster. Overall, it might make the most sense for the Patriots to keep at least one receiver from each of the aforementioned groups to form a diverse mix at the receiver position. As a result, we could very well see New England keeping Hogan, Dorsett, Britt, Patterson and Lucien based on what they have showed so far.